Brighten your loved ones' mailboxes this holiday season with hand-colored Christmas cards straight from your heart. 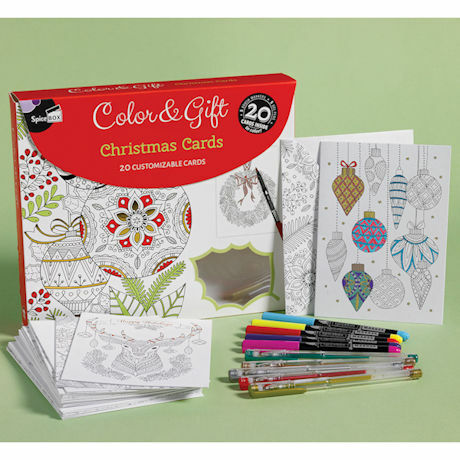 Our Color and Gift Christmas Cards are decorated with foil-embellished black line drawings—of Christmas ornaments, noble reindeer, bedecked evergreens, and lush wreaths—perfect for personalizing with the included metallic pens and colorful markers. Inside the cards you'll find ample blank space for your season's greetings. Kit includes a set of twenty 4¾"x6½" note cards, with coordinating decorative envelopes, five gel pens, and five brush-tip markers. For all ages.